Actually, of our three rescues, we know the very least about Darwin. When we got him, the foster home thought he could be anywhere from 4 to 6 months old and they seemed sure he was part Border Collie (since the rescue was for BCs) but they were told he was mixed with Dalmatian. Well, if he's half Dalmatian, I'm half giraffe, I would bet money he's got some black lab in him. Ooooh, right, Darwin and his birthday. So, after we brought the little beasty home, we took him to the vet who checked his teeth and gave us her best guess on his age and I used that to pick a date for Darwin's birthday. For those of you (aka, none of you) who want to mark your calendars, August 12th is the day. Darwin's been a handful in the past 8 months. To say we get a lot of use out of the carpet cleaner is an understatement, for sure. We're still working on some of the residual emotional problems he has as a result of his living conditions before we got him, but boy does he make up for it in other ways. Little D is sweet, loving, snuggly, smart, a quick learner and eager to make his people happy. We may have a long way to go, to undo his past, but it won't be because he isn't willing. I feel like I've gotten off on a tangent, was there something I needed to do? Oooh, right, the birthday dinner, you guys are still waiting for that. Sorry. Beautiful job and a grandiose gesture of love for their dogs. I really admire your knit projects and her affection and dedication to dogs. Congratulations to you and happy birthday to Darwin (very cute)! Wonderful birthday meal. Now I know why Darwin's had that droopy look. He had to wait for the "go" command. Well-behaved dogs! Love them. Aw, I loved the rotational plate checking at the end. No-one could agree on Oscar's birthday so we celebrate his adoption day instead. 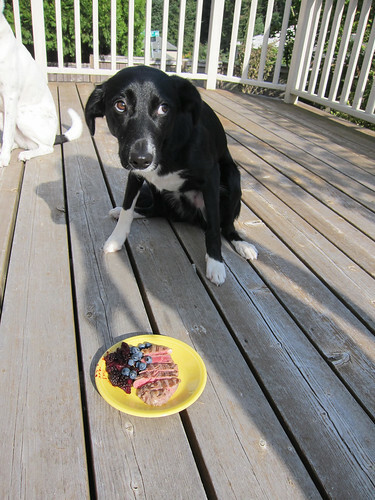 Ah, yes, start with dessert - smart dogs! I've been reading your blog for a while and although the knitwear is beautiful, I keep reading for the dogs. I love those dogs! Loved watching that video! They are all so cute. That's amazing they love berries like that. How healthy! What sweeties! And they loved the berries, didn't they. Darwin almost shares a birthday with Lunil - hers is the 13th. Thank you for sharing that little movie with us. Happy birthday, Darwin! I can't believe he's a year old already. I loved how they all checked out each other's dishes when they were done. And it's interesting that Panda--the only one who was an only child--is the slowest eater. So sweet! Funnily enough, we took Chappy out to buy treats for his birthday today. He turned 10 a month ago, but it's just been too darn hot to walk around town or go to the gourmet biscuit store, so that had been on hold until today (which was lovely). So, we celebrated today, too! Chappy sends lots of tail wags. We had a big birthday party for the dogs one year. We made steaks and hot dogs and something else I forget and served it to them. And it was all apparently a little TOO rich. Carpet cleaning ensued. 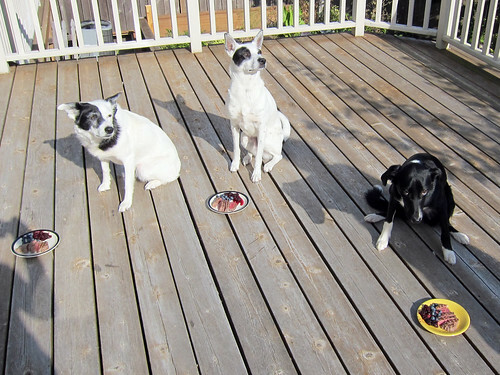 Your dogs are so well trained - they really sat and waited for your permission to eat :-) I'd love that and wish some of my neighbours would understand that dogs do better with certain rules applied... we still love them to death. That was awesome. I can't believe they stood perfectly still until you gave them the go ahead. Happy Birthday Darwin! All of your furry family are so beautiful and well behaved. Happy Birthday Darwin!!! Your doggies are all sooo cute! Love the addition of the fresh berries to the birthday feast! Happy birthday Darwin!!! This page contains a single entry from the blog posted on August 13, 2011 8:08 AM. The previous post in this blog was The Piddle King Turns 1. The next post in this blog is I like big projects and I cannot lie. .